Choosing a new Rotrex pulley and new engine RPM - Miata Turbo Forum - Boost cars, acquire cats. Right now I am running a 100mm pulley with a 130mm crank pulley on my Rotrex. It is geared to 10400 (10500 max RPM limit on the blower). I currently make 225whp ish. I am awaiting a new intake manifold from GotPSI? with CNC vilocity stacks and tapered plenum. That alone should help with power and torque across the board. Leave the engine RPM at 8000 and keep the current pulley. Have my buddy turn down my 100mm pulley to whatever I want. I am basically trying to guesstimate the tradeoffs of a lower RPM but more boost, earlier. I definatley use the 8000RPM limit right now and it makes power up there with the headwork, SUBs, and cams... but with a move to a lower RPM limit and running the blower faster at the lower RPMS may be a trade off I'm willing to take. Basically, for you turbo guys... what are your RPM limits? Do you find or wish you ever had a bit more? This is my boost map right now. A few extra PSI at the top end + some more in the mid-range could really work well with the new intake manifold I would think. If you're trying to make a stab at the boost curve you loose. It's a rotrex, that's how they are. Anyhow back to my original question, what rpm limits are you guys running ? You want more power? Meth. Spray meth. Pre and post blower. 5gph nozzles. No meth at this point. It's on the radar for the future possibly, in addition to what I'm trying to figure out right now.. I don't want to rely on band aids to make power at this point. With my current intake manifold I rev the motor usually to 7200-7500 because the torque still climbs and it is a noticeable difference. I can also make 15psi by 3200~ so I can't see a reason to rev it any higher. Hmmm. I've heard people say it's a band-aid before but I wouldn't consider it one at all. It's much easier then running race gas/e85 if you DD a car and provides the same benefits at less cost! Here's something to think about: more boost doesn't always mean more (or better power), especially with a supercharger. What is the efficiency range of that blower? At what point do you start blowing hot air? 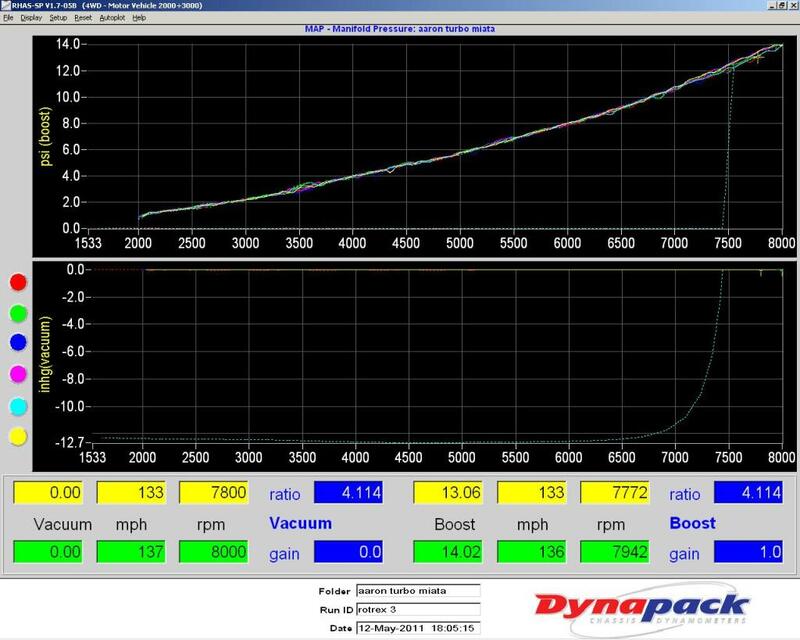 (This is where meth comes in because you can run more boost without blowing hot air) You should examine a dyno graph of your car and see at what rpm your hp and tq curves begin to fall off. If they don't fall off, then look for the point where they begin to go up at smaller intervals. You could try to focus the max rpm of your motor around or right above this point and possibly push more boost. Also, are you running a heat exchanger/ice box? If not, you could greatly increase your hp and tq by lowering your IAT's. That's the delima I have right now. With the stock intake manifold, torque peaks at 6500 and starts falling at 6800. With the new manifold it will be a completely different animal. But I think even with the manifold if I don't change the pulley it won't make as big a difference as I want. I am pretty confident I will drop it down, but I don't know if I will do 7600 at a 94mm pulley (turned down 100mm by a friend) or a 7250RPM and a 90mm pulley. I'm thinking the 7600 may be the way to go. I am running a FMIC, and the Rotrex is just starting to get into it's efficiency zone. I am close to %80 efficiency right now and I'm on the edge of the %80 island. The problem I am having is with the new intake manifold, the peak torque/hp is going to change. GotPSI said the manifold was built as a high RPM mani., and that I could keep my RPM at 8000, but I want to get a bit more boost. Based on the ignition timing I am running right now (2+5 WOT over 6000RPM without det) and the low AIT, I don't feel that AUX inj. is the next step. There is more to be done before having to go to that. Yeah, that's my understanding as well. It's already making less boost that I thought it would due to the heavily ported head etc. But I'm not worried about PSI at this point, the motor can take more no problem, I am limited by the max allowable RPM on the blower which is 10500 at the input shaft. Right now it's at 10400, so there is not exactly much I can do unless I lower the RPM limit. I am no going to overspin the blower. If you could choose b/w say... 18PSI peak at a 7250RPM limit or 16PSI peak at 7600, which would you take? Just for conversations sake. considering each setup has the same flow characteristics? I'd rather have the 18psi at 7250rpm (as long as the 18psi was not out of the blower's efficiency range or if I had the option to run meth if it was). This setup could potentially create the same amount of power, if not more, than the lower boost, higher rpm setup. This is based on the idea that both setups will not have downturns in either tq or hp. The lower rpm setup with equal or greater hp and tq would have a steeper curve for both and would feel faster. There would also be larger marginal increases between rpm levels (3-4k, 4-5k, 5-6l ect) with the higher boost, lower rpm setup. Is the c30-94 red line really at only 105k? The c30-74 is like 119k. I seem to recall that you are building this car as a full blown track car. If that's the case, over spinning the rotrex is a terrible idea. However, if it's just a fast street car, over spinning it is no big deal. Oscar Jr. told us it was not a big deal to spin these little things 15% over the redline, just not for sustained use that way. As for your theoretical, I would rather take the higher boost at lower rev limit, assuming that extra boost is making power not just heat. It's actually 100,000k. I really don't know why though because I presume it uses the same cartrige as the C30-74 and it's limit is 118,000RPM. In any case, I think overspinning the blower (unless it's a few hundred RPM on the compressor side) is a bad idea. I may be wrong though and it might be perfectly fine but I'm not willing to take the chance. At this point I'm considering having my 100mm turned down to a size that matches 7600RPM, which would be basically 93.75mm. We'll see. As much as I like the idea of more boost earlier, I like the powerband right now and I run 13's with a 4.1 final drive so the motor gets up there VERY fast. Difference Between NB 1.6 Engine And NB 1.8?